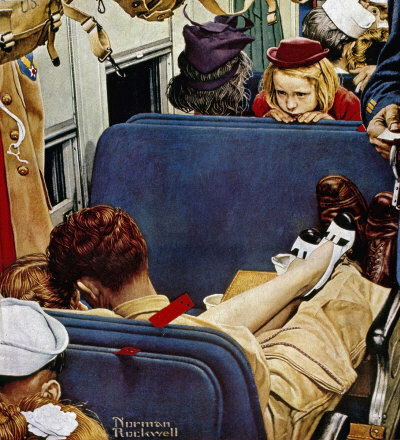 Little Girl Observing Lovers On A Train, a Norman Rockwell painting, appeared on the cover of The Saturday Evening Post published August 12, 1944. This is another favorite of Rockwell collectors, a classic enduring image of the world Rockwell painted. An alternate title for this painting is Travel Experience. This painting was Rockwell's 223rd overall out of 322 total paintings that were published on the cover of the Saturday Evening Post. Rockwell's career with the Post spanned 47 years, from his first cover illustration, Boy With Baby Carriage in 1916 to his last, Portrait of John F. Kennedy, in 1963. This was also the first cover for The Post in 1944. In 1944, there were nine Norman Rockwell Saturday Evening Post covers published. The location of the original oil on canvas painting, 22 x 20 inches or 56 x 50 cm, is not known. on page 157 of Norman Rockwell, A Definitive Catalogue by Laurie Norton Moffatt. One study also appears in the Norman Rockwell Catalogue on pages 157. In this painting, Norman Rockwell shows us an all-to-familiar situation, a child not realizing that it is impolite to stare. This young lady probably does not know that it is rude to invade the privacy of the returning serviceman and his girl. We cannot tell whether her mother is aware of her indiscretion or not. Maybe her mother is reading a book and is caught up in the story. Either way, the two lovers are paying the young girl little heed. They are more interested in each other than in her prying eyes. Little Girl Observing Lovers On A Train was only one of 322 Norman Rockwell Saturday Evening Post covers; Here is the list of Norman Rockwell Saturday Evening Post cover illustrations. The little girl is portrayed by Yvonne Cross. Yvonne Cross also modeled for 1947's Going And Coming and the 1949 Four Seasons calender image, Young Love. Do You Have A Great Story, Opinion Or Contribution About Little Girl Observing Lovers on a Train?